I've had some lovely walks these past few days. Somehow, even after my foot healed up, I continued to forget how gorgeous it is here and how incredible it is to be out of doors. I secluded myself in my studio and worked. And worked. I'm striving for balance now, because I know this upcoming year is going to be an incredibly crazy one. I want to be ready and I need to re-learn how to relax. I've gotten out of the habit of meditating, of doing 5 good things with my family (we each get a turn at the end of the day to tell about the good in our days), and - most of all - I haven't gone outside nearly enough. So yesterday in my quest to find my center again, this is where we ended up. 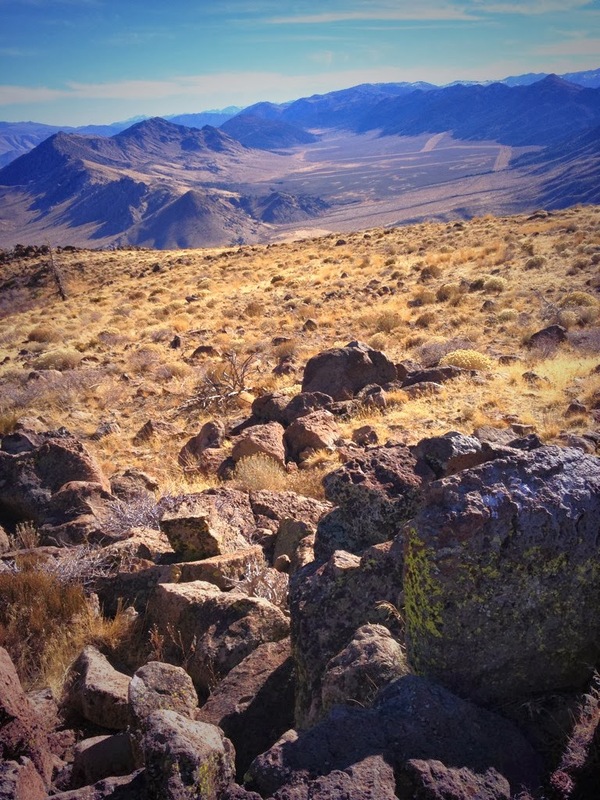 It's only 10 minutes from the house, and this is looking across the Sierras to the south. #1 Son says he'll be building a cabin to the left in the valley down there, for the spring and summer. It's difficult to tell at this distance, but there's a swath of Aspen across the valley floor where the snow melt runs through. Note: we will be returning next fall when the Aspen are in full color. Between walks, I've been getting the box of Valley Yarns from WEBS organized for my upcoming oddments knitdown. 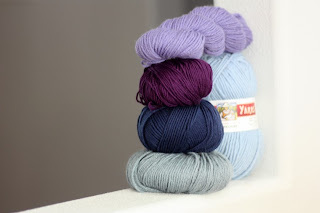 Pictured above, from the bottom left, clockwise: Deerfield (80% alpaca, 20% silk, 109 yards/50 grams): Stone Blue; Valley Superwash dk (100% extrafine merino wool, 137 yards/50 grams): color 18 - a deep blue; Southwick (52% pima cotton. 48% bamboo viscose, 105 yards/50 grams): color 27 - a rich deep purple; Stockbridge (50% alpaca, 50% wool, 109 yards/50 grams): Periwinkle; and Berkshire (85% wool, 15% alpaca, 141 yards/100 grams): color 24, Light Blue. 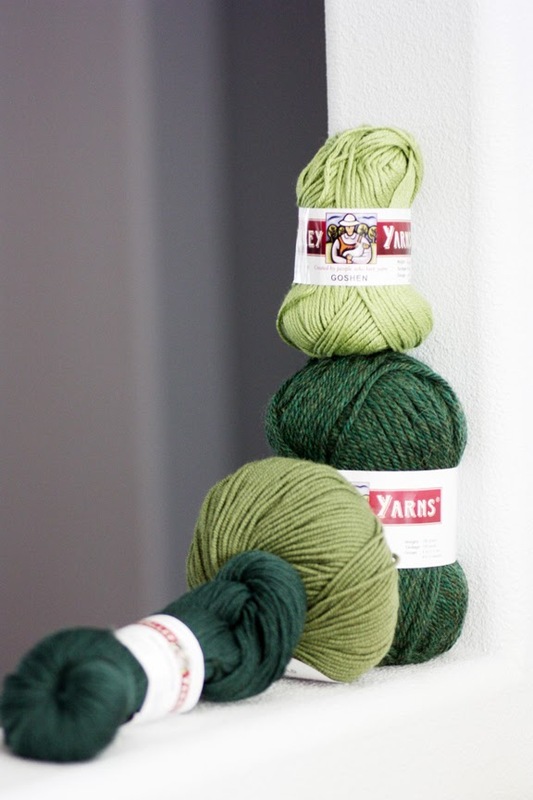 Pictured above, from bottom left counter-clockwise: Huntington (75% fine superwash merino, 25% nylon, 218 yards/50 grams): Forest; Northfield (70% merino, 20% baby alpaca, 10% silk, 124 yards/50 grams): Avocado; Northampton Bulky (100% wool, 109 yards/100 grams): Dark Green Heather; Goshen (48% Peruvian cotton, 46% Modal, 6% silk, 92 yards/50 grams): Green Apple. 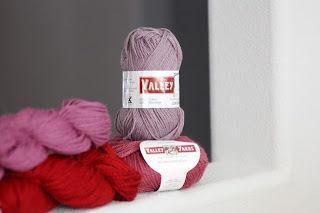 Pictured above, from top left, counter-clockwise: Northampton Sport (100% wool, 164 yards/ 50 grams): Raspberry Heather; Buckland (60% fine superwash merino, 20% mulberry silk, 20% nylon, 109 yards/50 grams): Ruby Red; Colrain (50% merino, 50% tencel, 109 yards/50 grams): Mauve; Longmeadow (60% cotton, 40% microfiber, 117 yards/50 grams): Purple Haze. 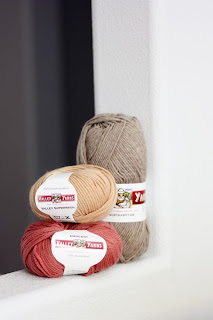 Pictured above, from top left, counter-clockwise: Valley Superwash (100% extra fine merino superwash, 98 yards/50 grams): color 617 - a light tan; Amherst (100% merino, 109 yards/50 grams): Wild Rose; Northampton (100% wool, 247 yards/100 grams): Fawn. 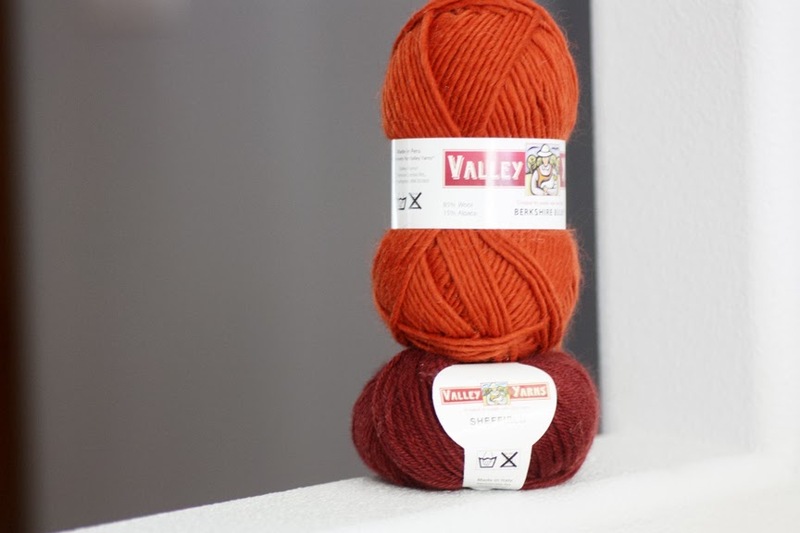 Pictured above, from bottom, up: Sheffield (70% merino, 15% silk, 15% angora, 120 yards/50 grams): color 23 - a deep rust; Berkshire Bulky (85% wool, 15% alpaca, 108 yards/100 grams): color 18, Copper. 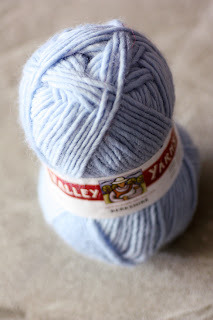 Pictured above is my first up: the Berkshire in Light Blue, and I am loving knitting with this yarn. It's similar in weight to my favorite Lopi sweater (I was a sweater knitter for years, and that's something else I need to get back to! ), but the alpaca makes it loads and loads softer. I wear a turtleneck with my Lopi, but I'm guessing this one would work against my skin, and I don't think I would itch at all. It's a fat single, so it knits up lofty. The alpaca gives it a light halo, making it extra warm and snuggly. Stand by, as I will be releasing the knitdown as a subscription eBook this coming Wednesday, and it will be discounted until the first pattern is released! Can't wait to play along!! How fun! Maybe I'll go shopping at Webs today! I love the idea of the knitdown book! Looking forward to seeing it develop and knitting along.